Christine Wright danced as a member of the Lar Lubovitch Dance Company and studied with NYC ballet guru Maggie Black. Photo by Francisco Graciano, courtesy of the photographer. Dance teachers are often naturals when it comes to nurturing. Even so, certain individuals seem particularly gifted in connecting with their students. Maybe they have an uncanny sense of exactly the right prompt or image that allows a correction to click into place. Perhaps every student who leaves their class feels like a star. DT singled out five such instructors to discover just what makes their classes magical. Try to describe Christine Wright's ballet class, and you'll realize it sounds like a litany of contradictions: It's a ballet class, but it starts on the floor; Wright possesses formidable anatomical knowledge, but she shies away from what she calls “overintellectualizing" her students; her class is serious, but she isn't interested in your unbelievable extension or triple pirouettes. For almost three decades, Wright's daily ballet class drew hordes of New York City dancers—many of them professional modern dancers. “I teach an extremely unconventional ballet class," she says. “I feel fortunate that the dancers in New York gave me a lot of latitude, that I could say to them, 'We're going to start on the floor,' and they would follow." Wright has worked hard to earn this seemingly blind acceptance. Her purpose in having her students begin by lying down is twofold: One, it directs dancers “out of their overly busy, overly distracted minds" and back into their bodies; two, her exercises anticipate problems she sees students struggling with later in class, while standing. “For instance, turnout," she explains. “It can be too specific and detailed to deal with off the floor. But after we get up and start the barre, we can just go. We don't have to talk about turnout." Students return because of the results they see in their own relationships with technique, musicality and expressiveness. Francisco Graciano of the Paul Taylor Dance Company is one of them. “When she talks to you," he says, “there's a feeling that she's paying closer attention to you than anyone ever has, as if the class exists solely for your benefit." For others, Wright's class reminds them why they started dancing in the first place. Her classroom is a place of calm inclusion and undivided attention. “It feels like people are so stressed in New York," she says. “It's so expensive, and there's so much pressure on dancers because it's so hard. Dancers have jobs, and they're taking class on their break. So if they're coming into class with this incredible load on their backs, it's really important to bring people back to why they wanted to dance in the first place." Stafford Berry is the artistic associate of the African American Dance Ensemble, co-director of the Berry & Nance Dance Project, and a guest teacher with the American Dance Festival. Photo courtesy of Stafford Berry. At 6' 5", the agile Stafford Berry is an unforgettable presence at the front of his African/Diasporan class. Wearing baggy beige pants, a blue tank and an American flag bandana around his head, he is both commanding and approachable. “I like to start with everyone gathered together so we can be in one small, sacred space, connected and protected in a circle," he says, explaining the concept of “bantaba," a West African term for “dancing ground." This is his opportunity to check in with students, gauging where they are physically and mentally that day. “African dance is a dance that everyone can do, no matter who you are. That's part of my approach," he says. He embraces diversity and individuality, and yet he doesn't shy away from demanding technical excellence. It's that inclusiveness that sets him apart. It's not unusual for new students to feel intimidated by African dance, and Berry says that's especially true for classically trained dancers. One thing that helps is to sing—a practice that makes newcomers uncomfortable at first, but soon lowers their inhibitions. “No matter where I teach, we sing. It's not necessarily about hitting the right note. It's about the collection of voices increasing the vibrations in the room. They do something to the bodies in the room," he says. 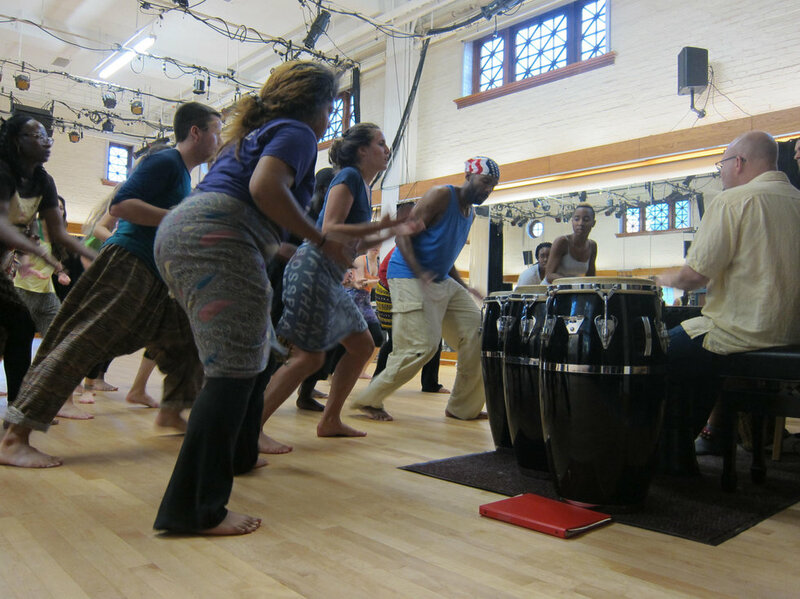 In a call-and-response exercise, the class sings a Mandinka chant called “Kyra Silo," which means “by way of peace." As the class continues, students repeatedly cross the floor, jumping and swinging their arms in opposite directions, until finally Berry is satisfied with their performance. He acknowledges students' progress and those who are grasping the material well. As he demonstrates a combination, he travels across the floor in only a few strides, giving a new meaning to the term “full-out." It's a tough class, but Berry's obvious joy is contagious. Students report leaving with a range of experiences from “I had fun," to a deeper feeling of empowerment or rejuvenation. He has shattered their preconceived notions about who can do African dance and brought out their strength and versatility. In demanding greatness, he has made all the students rise to the challenge. George Staib has danced with the Limón Dance Company and David Dorfman Dance and now directs his own group, staibdance. Photo by Mark Teague, courtesy of Emory University. George Staib teaches an easy modern class. It's not without demands or overly simplistic, just easy in the sense that all are welcome, that movement can be distilled into basic image-based tasks, that a botched across-the-floor phrase isn't the end of the world. Staib definitely keeps his students, well, on their toes. “He's the kind of teacher you'd do anything for, just to hear him say you got it right," says Mary Schindler, who took master classes with him while a graduate student at Florida State University. “A lot of the time in classes, we're working toward a performance," says Staib. “But I want my class to be a laboratory. And I ask my students to sign everything they're doing with who they are. They enjoy that freedom to play, to stretch and go beyond a rule that might've been enforced when they were younger." This laid-back approach is a somewhat recent development. Staib used to give long, complex plié combinations. His simpler, streamlined exercises are influenced by his study of Gaga, the movement language developed by Ohad Naharin. “Now I'm more interested in the simple essence of each action, finding the feeling and pleasure of a tendu all over again," he says. “I want my students to love the way it feels to move—I think that sometimes goes away." Staib's classroom has always been a place where those new to dance feel welcome. A late bloomer himself—he didn't discover dance until his sophomore year of college—Staib can easily recall his own frustration over trying to grasp concepts his classmates had spent years mastering. “I'll go to the people who are most scared," he says. “I think they're afraid to try because they attribute everything we do in dance to a skill. But I'll remind them it's not a skill to stretch your arm to the sky—you do this when you reach for your shoes in the closet." He also keeps class light with a healthy dose of humor. A bungled combination might elicit a sarcastic “What the hell was that?" While a phrase well-done could earn something as silly as “Get it, Beyoncé!" He says, “I like to remind my students that no one just died because they messed up a tendu." And for those who underestimate the power of a relaxed atmosphere, dance major James LaRussa credits Staib's approach with broadening his ballet focus to include modern. After several years in Atlanta Ballet's pre-professional program, LaRussa came to Emory initially interested only in balletic movement and choreography. “Together, though, we've found some new stuff," says Staib. “Seeing how quickly he was willing to trust the classroom process was moving to me—how he releases his spine now, what he's started gravitating toward choreographically." Kathleen Hermesdorf was a member of Bebe Miller Company and Margaret Jenkins Dance Company, and worked extensively with Sara Shelton Mann/Contraband. by Yvonne M. Portra, courtesy of ALTERNATIVA. Kathleen Hermesdorf pauses when asked what kind of dancers are attracted to her classes. “A bit of a wild spirit," she says, “a disciplined body and a bit on the rock-and-roll side." She could add “passionately devoted," as dancers flock to her classes at ODC School in San Francisco and at festivals and universities around the world. Hermesdorf, who teaches in collaboration with musician Albert Mathias, weaves together elements of contemporary dance, improvisation, Qigong and bodywork in classes designed to challenge students to explore their own expressive voices. Dancers start out on the floor, in guided improvisation. Mathias creates a soft but constantly thrumming soundscape. The class, which Hermesdorf refers to as a “hybrid," is made up of several elements; dancers progress through different spatial levels into a large circle and are paired up for bodywork. They massage, pat and manipulate each other's bodies. This is followed by improvisation (solo and in pairs and small groups) across the floor. Hermesdorf offers a guiding concept of “space" and plays with it (“shake the space around us," or “sculpt the space, feel the geometry") for each round of improvisation. Student Stephanie Sherman says, “It shakes you up to dance with someone else, who has a different body and movement vocabulary, and that influences the way you dance." The class then shifts to a more traditional format of combinations that Hermesdorf demonstrates. Dancers fly through the air, swooping upside down, shooting legs in wide arcs and snapping into ending shapes as Mathias' music gains force. “One of the reasons people come to our class is the big sound and big movement," says Hermesdorf. “Going upside down is super liberating. People come to flip around and roll around and sweat and try to fly." Hermesdorf herself is an extraordinary mover, with a fiercely individual style that is as enigmatic and intellectual as it is expansive and athletic. Not surprisingly, she has dedicated followers, several of whom even share her punk chic half-shaved/half chin-length hairstyle. But Hermesdorf doesn't impose her way of moving on students; in class she dances among them, alternating easily between mentor and instructor. “We start class off in such an experiential way," says Sherman, “that by the time we start doing choreography, it's crazily expressive. It's fun, it's cathartic and it's hard, but not because of any mold she's trying to fit us into. She's not trying to make dancers little Kathleens. She gives us the tools to discover new possibilities for movement within ourselves." Hermesdorf calls her technique GUT Motives. “General unified theory, but also from the gut," she explains. “I pull in the things that for me really work for superefficient, powerful, articulate movement. 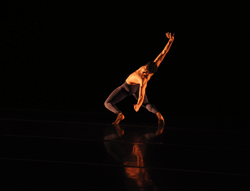 This is my idea, filtered through my teachers, dance history, somatics and improvisation." Kristin Sudeikis has developed a following for her contemporary dance classes that borders on the devout. Studio owner Christy Curtis calls her class “soul Sunday, like church for dance." Broadway Dance Center student Rachel Warren says, “I call her a missionary of movement." Indeed Sudeikis' devotion to the craft percolates throughout our conversation on a fall weekday. She can't wait for her afternoon class at Broadway Dance Center. She also teaches at Peridance in NYC, and she's in demand as a guest artist at studios across the country and internationally. “I brought her in three times this year," says Curtis of CC & Co Dance Complex in North Carolina, whose competition dancers routinely earn honors with New York City Dance Alliance and The PULSE on Tour. “I've never in my life seen someone who could teach a class and everybody walked out thinking they were the best person in that class. She was so motivating, it was incredible." In a genre that tends to emphasize choreography, Sudeikis' classes are uniquely steeped in a solid base of technique. “On a physical level, it's a demanding class," says Warren. “Kristin calls technique our grammar. Once you have that foundation, you can dance from your soul." Throughout class, Sudeikis gives students opportunities to make artistic choices, providing both structure and freedom. “She gives you the steps, which then you can interpret in different ways," says student Adriana Recchia. “She shows it to you, but it's up to you to make something out of it." 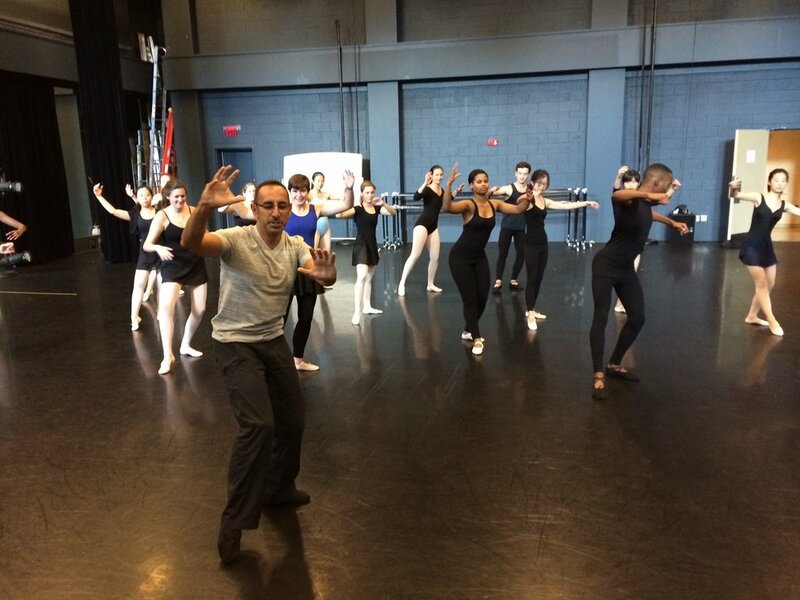 A fountain of positive energy, Sudeikis finds unique ways to encourage dancers to develop their artistic voices. “Sometimes I have them close their eyes. It taps back into why we started dancing, which is because of how it felt," she explains. “A tendu, how does it feel? Am I doing it robotically? Does that extend to my life—am I just doing what I'm told or what I actually want to do?" One reason her classes resonate beyond the studio is that Sudeikis draws parallels between lessons in dance and in life. “When a dancer falls, I say, 'It's not about the fall, but how you get up,'" she explains. “Are you still worried that people saw you fall, or can you just get up and move again?" She leavens the emotional intensity with flashes of humor, asking the next group of dancers mischievously, “Will anyone mind if someone messes up? Will you tweet #theymessedup? My dad said, 'Kristin, don't worry about what other people think. They're just worried about what everybody else is thinking about them.'"